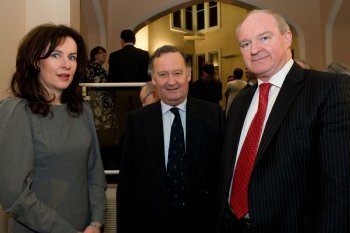 Professor Deirdre Heenan, Recorder of London Judge Peter Beamont, and Lord Chief Justice Declan Morgan at the University of Ulster, Magee. Sir Declan Morgan, the Lord Chief Justice of Northern Ireland, says the Hillsborough Agreement opens the prospect of a new role for the judiciary in furthering communication with politicians and the community to ensure that public confidence in administration of justice is enhanced. Speaking at a dinner at the Magee campus of the University of Ulster to mark a two-day visit there by the Recorder of London, Judge Peter Beaumont, Sir Declan pledged to play his part in that process and he welcomed the Agreement’s recognition of the independence of the judiciary. Senior members of the Northern Ireland judiciary, solicitors from Londonderry and across the North West and senior University of Ulster academics attended the dinner in honour of Judge Beaumont, who earlier delivered an address on advocacy to trainee solicitors from the Graduate School of Professional Legal Education, undergraduate LLB students from the School of Law and LLM students from the Transitional Justice Unit, at Magee. Judge Beaumont spent Monday at the campus where he was briefed on the work of the School by its Director of Studies, Mr Paul Mageean, and Dr Tom Murphy, Head of the School of Law at Ulster, before seeing its facilities at first-hand. The School, which was launched two years ago, is the only graduate solicitor training centre outside Belfast. On a tour of the campus, he saw examples of innovative work at the Intelligent Systems Research Centre and the School of Creative Arts and was updated on the University’s plans to expand Magee. Judge Beaumont’s visit was arranged with the assistance of the Honourable The Irish Society. On Tuesday, after spending more time with staff and students at Magee, he visited the Courthouse at Bishop Street where he lunched with members of the judiciary before returning to London. The members of the judiciary were welcomed to Monday’s dinner by Professor Ann Moran, Dean of Faculty of Social Sciences, and Professor Deirdre Heenan, Dean of Academic Development at Magee. In his address, the Lord Chief Justice said the establishment of the Graduate School of Professional Legal Education had been made possible by the University’s commitment and vision. Turning to the publication of the political agreement at Hillsborough, Sir Declan said: “As a result of that agreement there is for the judiciary the prospect of a new role to play in furthering dialogue and communication with both politicians and the community. "The clear objective must be to ensure that public confidence is enhanced in the administration of justice. It is a given in the common law traditions of Britain and Ireland that a cornerstone of such confidence is access to an independent and impartial judiciary. “I am, therefore, particularly pleased to note that the independence of the judiciary and the contribution that this makes to public confidence have been expressly recognised in the text of the agreement. “The corollary of this is that the independent judiciary also has an important role to play in respecting the proper democratic limits to the area of competence which is reserved to it. In other words, we must respect the Government’s role to make policy.